Watch year: 2017. All images shown are of the actual watch. BLACK TITANIUM CARBIDE COATED TITANIUM CASE WITH A BLACK RUBBER STRAP. BLACK RUBBER COATED UNIDIRECTIONAL ROTATING TIMING BEZEL. BLACK VERTICAL STRIPED DIAL W/ THREE BLACK SUBDIALS, LUMINESCENT STICK INDEXES, & DATE MAGNIFIER AT 3. LUMINESCENT STEEL HANDS. AUTOMATIC SELF-WINDING CALIBRE 16. SCRATCH RESISTANT SAPPHIRE CRYSTAL. SCREW DOWN WATER RESISTANT. BLACK TITANIUM CARBIDE COATED TITANIUM CASE BACK. CASE DIAMETER: 44 MM. CASE THICKNESS: 16 MM. DUAL PUSH-BUTTON FOLDOVER DEPLOYMENT. WATER RESISTANT AT 500 METERS / 1650 FEET. FUNCTIONS: HOUR, MINUTE, SECOND, DATE, CHRONOGRAPH, HELIUM RELEASE VALVE. 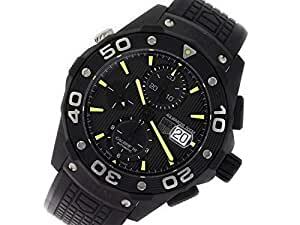 TAG HEUER AQUARACER CAJ2180.FT6023 MENS WATCH. COMES WITH GIFT BOX AND 2 YEAR PWJ STORE WARRANTY. *PLEASE NOTE THAT THE PRODUCTION YEAR OF THE LISTED WATCH IS AN ESTIMATION ONLY*. BUY WITH CONFIDENCE KNOWING EACH TIMEPIECE GOES THROUGH THE SAME RIGOROUS 31-POINT INSPECTION. REST ASSURED ONLY AUTHENTIC PARTS STRAIGHT FROM THE MANUFACTURER ARE USED. THE CERTIFIED PRE-OWNED PROGRAM ON AMAZON ENSURES PEACE OF MIND AND TRANSPARENCY VIA STANDARDIZED REPORTS AND A 1 YEAR WARRANTY PROVIDED BY WATCHFACTS.